While many Bengals players are still working out at their offseason locations, Jerome Simpson is part of a group training at Ignition during the lockout. Simpson was part of a group at the Mason facility on Wednesday that included Domata Peko, Tank Johnson and Rey Maualuga. One advantage of working out at Ignition is that Clif Marshall was on the Bengals strength and conditioning staff from 2005-07 and also worked on speed drills with the team during recent offseason programs. “I feel like I’m in better shape than I was last year,” Simpson said. Whenever things get back to normal, Simpson will be counted on to be an important part of the offense. Given his chance to show what he could do in the final three games, Simpson had 20 receptions for 277 yards and three touchdowns, including 12 catches in the finale at Baltimore. A talk with head coach Marvin Lewis following the Week 14 loss at Pittsburgh helped serve as a springboard to Simpson’s late-season run. “Marvin knew some kind of changes had to be made late in the season and see what us young guys can do,” Simpson said. “The talk kind of eased his mind because he knew that I was still hungry and wanted to win our club some games. We couldn’t do it in the last game, I had a couple of mistakes and fumbles but I think we could have pulled that game out. I have to learn from my mistakes. Even if the Bengals draft a receiver in the first round, it’s tough to imagine Simpson not being a part of the starting lineup. 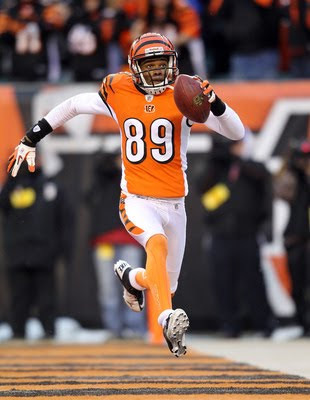 While a lot of people continue to wonder who will quarterback the Bengals, a receiving cast of A.J. Green or Julio Jones, Simpson, Jordan Shipley and Andre Caldwell with tight end Jermaine Gresham would be extremely intriguing. Yes, we still put the odds of Chad Ochocinco being on the opening day roster at slim but stranger things have happened with this team. Simpson got to meet offensive coordinator Jay Gruden before the lockout and said that he thinks it will be a good fit. Among the things that Simpson is working on at Ignition are improving his lateral quickness and being better with his footwork. The week of the NFL Draft, Simpson and most of the Bengals receivers will be in Southern California working out with Jordan Palmer. “We’re going to go down there and get that bonding experience so that when we can go into camp we can be on the same page with each other,” Simpson said.